The following profile of Robert Reed was printed in the "Sunday A.M." section of the January 11, 2004 issue of the Lincoln (Nebraska) Journal Star newspaper. The interview was written by staff reporter Jeff Korbelik, with accompanying photo by staff photographer William Lauer. We thank them for their kind permission to reprint this article for Robert Reed fans who otherwise would not be able to see it. In the basement of a tiny house on a quiet street near Antelope Park, the most famous Nebraska author you've never heard of follows his passion. 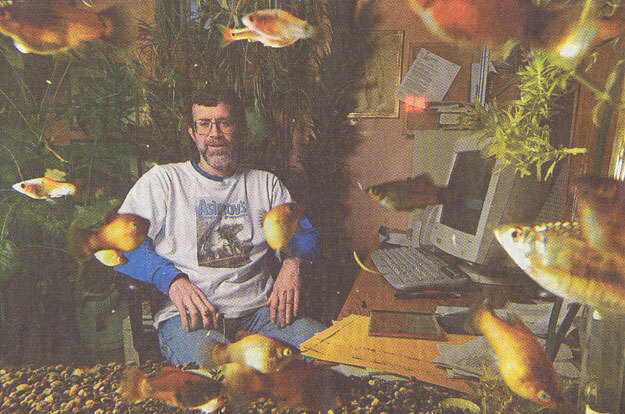 Sitting at a computer, surrounded by an ecosystem of giant plants and an aquarium filled with fish of various sizes and colors, science fiction author Robert Reed lets his imagination fly. What if the crew of a spaceship discovers a planet within the ship's hull -- the premise of his critically acclaimed novel Marrow. Or what would happen if 1,000 people, by their superior wisdom and abilities, are chosen to safeguard humanity's future, as is the case in his latest book, Sister Alice. His creativity surprises even his wife, Leslie. "It's amazing to me a lot of the time," she said. "Day-to-day life, he is very prosaic, but when I read his stories, I say, 'My God, where did this come from?'" Robert "Bob" Reed, 47, relaxes on the couch in his living room. The early afternoon sunlight pours through the picture window and bathes the Christmas tree across from him. The family dog, Roxy, a 10-year-old brown and white Siberian Husky, snoozes in the corner. His 2-year-old daughter Jessie's toys are scattered here and there on the floor. The rail-thin Reed is in blue jeans. He has pulled a black Lincoln Marathon T-shirt over a long-sleeve white one. The marathon shirt hints at his passion for long-distance running. He can be found regularly on Lincoln's streets and trails and competing in local road races. His hair is dark and wavy, it and his signature beard streaked with gray. "Was there a turning point in your career?" the interviewer asks. Reed shakes his head and smiles slyly in response to the question. "The second sale I won the Writers of the Future award, but I can't say it was anything more than a nice little moment. "The first novel...the first time I was nominated for a Hugo...All these things I look back on as moments, but not as turning points," he said. Reed has published more than 100 works, including 10 novels, since winning the L. Ron Hubbard Writers of the Future contest in 1986 -- one year before he dedicated himself to writing full time. Today he is considered one of the top (and most prolific) science fiction authors in the world. He is adored in France and loved in England. His short stories appear regularly in the Magazine of Fantasy & Science Fiction and Asimov's Science Fiction. Sister Alice, released by Tor in October, is available in the science fiction/fantasy sections of most bookstores. And though he has had no turning points, he has had a few epiphanies, including a memorable one in 1984 -- he remembers the year because, like most Nebraskans, he can tie it to a significant football event such as losing a national championship on a failed two-point conversion. He had just moved to Dallas, where he believed the bright, clear days would help open his mind and aid him in becoming an accomplished writer. "While I was there," he says, "I realized most of the writers I respected and wanted to emulate all had terribly gray hair." "In other words, this is a slow business to have success in. There are exceptions, but for the most part it's kind of like the last writer standing," he said. When told he's beginning to show signs of aging, he readily agrees and ends this part of the conversation with a metaphor. "I've got gray," he says. "I've got plenty of gray. I'm creating a career slowly, like a coral reef." Reed was 12, maybe 13, when he filled a couple of spiral notebooks with words. "I tried to write a novel," he said. "It had one thing happening after another. It seemed to be science fiction. It was a strange place with monsters. I was heavy into monsters." Uncharacteristically, Reed set his pen aside and didn't pick it up again until college. He admits he "obsessively" does things, from long-distance running to writing to landscaping his back yard. But for some reason, writing didn't take hold back then. "If I would have stayed with writing, it definitely would have changed my life," he said. The reason he came back to it: He thought it would be an easy way to make money. "I know, it was stupid," he said. "I was extremely naïve." Money was also why he majored in biology at Nebraska Wesleyan University. "I always kind of thought if I needed a job, that would be a really rich area to go into," he said. But then he discovered he didn't want to be a scientist. He learned he wasn't into lab work -- he worked as a technician at NWU from 1979 to 1980 -- or conducting experiments. Theory was a different story. He found he was partial to such subjects as quantum mechanics. This explains his penchant for science fiction instead of mysteries, westerns or romance. "I like science fiction because it has ideas that interest me," he said. Reed is a far cry from the stereotypical science fiction author. He didn't read a lot from the genre growing up. "I've never considered myself a fan," he said. "I'm not in 'fandom.' I never attended a convention until I was a writer." Even his work is atypical. Most of the industry comprises novels, series and interrelated worlds and universes. Reed prefers to jump from one idea to the next, usually in short story form. "I like to have an arena where I can get the thing done," he said. "Play with the concept, but not marry it. I don't want to live with it for months on end." There have been exceptions. He just finished writing the sequel to Marrow, his biggest commercial success. It's slated for release early next year. "I enjoy this ship I built and its possibilities, so I'm willing to spend more time with it," he said. And unlike some of his peers, he avoids the limelight. He probably is one of the most celebrated Nebraska authors you've never heard about. His latest novel is not on display at local bookstores. In fact, most of his novels are available only at libraries or through mail order. Granted, science fiction doesn't stay in print long, which makes it difficult to showcase a writer. But a more likely reason for Reed's anonymity outsid sci-fi circles is his own selflessness. He is not one to toot his own horn. "He's not huge into publicity," said Scott Clark, a Reed fan and Web site manager for the local science fiction club Star Base Andromeda. "He appreciates the writing more than the self-promotion." His friends acknowledge as much. Running partner Marty Berger said their conversations rarely are about Reed's profession. "We talk all the time, but we talk about sports (Reed is a Chicago Cubs baseball fan), about gardening and about fish ponds," Berger said. "We talk a lot about fish ponds. He's got me into them." Reed said his wife, Leslie, a reporter for the Omaha World Herald, has encouraged him to be more aggressive about getting his name out there. "She told me if I was a more difficult writer, I would get better attention," he said. "So I would start acting more difficult around the house, and that talk would go away." "In order to be a difficult writer, you have to be a difficult person," he said. And that's just not him. When a conversation does turn to writing, Reed discusses it in his own roundabout way. He asks the listener to discern his or her own meaning from his words. Like his talk on self-expectation. "When I was a kid," he says, "my father would take (my brother and me) hunting, and I remember how impatient he was with us." "With me, I remember very distinctively: I'm carrying a double-barreled 20-gauge shotgun across the snow, and it's getting deep. "Now I have a 2-year-old, and I find myself not yet doing that, but there seems to be a pushing of expectations. Not everybody appreciates Reed's talent. He smiles again when told a local bookseller described his work as "grim." He has heard it before. "It occurs to me, when I watch other people's faces, that what I do for a living is a pretty grim business. "If I needed to put together a resume, I would say I was one of the great experts at apocalyptic crap. I can generate 100 ways in which the Earth dies." His wife doesn't find his writing depressing, though she may be biased. She finds it real. "What I like is he does a nice job of making (science fiction) human," she said. "You recognize his characters as people." Local fan Clark, too, noted the emphasis on humanity rather than technology. "There is a lot of deep emotion in his stuff," Clark said. "Some of it is depressing, but I find it engaging." Like most writers, Reed draws from the world around him. From television. From Lincoln. From his family. From the news. He's inquisitive. He visits the public library at least once a week. Friend Kerry Eagan said their Saturday morning conversations at a downtown coffee shop will range from mad cow disease to inflation to what would happen if a comet hit the Earth. "He tells me of a number of ways the Earth can be annihilated," Eagan said. "He also tells me not to get too worried about this stuff." Reed worked part time for nine years (1978-87) in a Lincoln factory before becoming a full-time writer. Factory work, he said, didn't influence his writing, but it has affected him in other ways. "Occasionally, I'll dream I'm in the factory," he said. "That will help me write. Not creatively, but more like a prod. I don't want to go back there." He's anxious to see if fatherhood takes him in any new, wondrous directions. He knows he already approaches writing dialogue differently. "I had a debate with my daughter this morning (about) whether she pooped or tooted," he said. "It's a line of talk I never really imagined before." Reed also is experimenting with other genres. He's made a couple of tries at thrillers and has penned a "running novel," though he's not sure how to sell it. "It doesn't have a distinct and easily identifiable market," he said. "There isn't a long line of running novels." His agent told him there was money in serial killers. "I did the research and got really depressed," he said. "That was the worst depression I've had. I couldn't write anything about it." He does know one thing: "My ability has gone up," he said. "I've learned more about how to do this. I make mistakes, but when I make mistakes, I know I've done it." That's what makes it a whole lot easier to respond to the "what ifs."